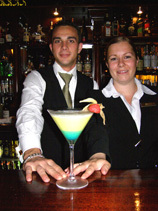 Perrots Garden Bistro at Hayfield Manor in Cork, Ireland features Mediterranean and International cuisine. During our September 2007 stay at Hayfield Manor, a member of the Small Luxury Hotels of the World, each evening Edward F. Nesta and I would begin with a pre-dinner cocktail in The Manor Bar with its warm and inviting clubby appeal and interesting cocktail menu. Assistant Bar Manager Jenny Russell is always creating new cocktails, and when she told us about the latest cocktail that she had created we were eager to sample "The Garden of Eden." It was definitely a winner made with Blue Curacao, Midori, Pineapple Juice, Fee Brothers West Indian Orange Bitters, a drop of peach juice, and cream, and a perfect way to begin our evening before having dinner at Perrots Garden Bistro. The ambience at Perrots Garden Bistro is one of stylish and casual elegance with tall beige arm chairs, glass and wood tables smartly dressed with black leather placemats, white napkins, green glass holders with tea lights, and wrought iron double lamps with cream shades on the tables. The architecturally interesting vaulted ceiling features miniature high hat lighting, Asian paddle fans, four orange chandeliers, and there large ivory marble tiles on the floor, sage green pleated fabric to the floor framing bay windows lined with flowers on the windowsills on three sides of the dining room, and there is padded ribbed mushroom fabric on the fourth wall. Live plants and two giant whimsical mushroom floor lamps add to the charm and visual appeal of the restaurant. Perrots Garden Bistro has an excellent wine list, however after experiencing the Garden of Eden pre-dinner, we decided to forego wine, and perhaps have an after dinner nightcap instead. Edward began with a starter of Chowder of West Coast Seafood, which was a generous portion presented in a deep bowl filled with pieces of salmon, calamari, prawns, celery, onions, potatoes, diced carrots, and cream to round out the hearty and delectable chowder. This being Ireland, I selected the Leek and Potato Soup as a starter, which was a rich yet delicate harmony of leek blended with potato to create a light green soup that spoke volumes about Ireland. Although the main courses listed on the menu looked very appealing, Edward selected the special of the day, which was traditional Irish stew. Beautifully presented in a broth with generous chunks of lamb, potatoes, diced carrots, onions, celery, and sprinkled with parsley, it was unlike other versions of Irish stew that he had previously had in the United States, which more often than not involves thick brown gravy; this version was absolutely wonderful. 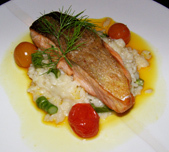 I selected their fresh caught fish of the day special, which was another hearty meal with fried salmon on a bed of perfectly cooked creamy risotto redolent with asparagus, mushrooms, and a cheese sauce, surrounded with a pool of rich broth and three cherry tomatoes, and garnished with dill. Completely satisfied, we decided to pass on dessert even though the dessert menu looked lovely. Having dinner at Perrots Garden Bistro was another great ending to our stay at Hayfield Manor Hotel. Please read other articles on Hayfield Manor Hotel in Hotels and Resorts, about their other restaurant, Orchids Restaurant in the Restaurants section, and Chefs' Recipes where Head Chef Graeme Campbell shares a few of his tasty recipes.